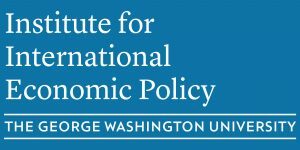 The Institute for International Economic Policy welcomes Bob Koopman to discuss “Trade and Growth: Past, Present, and Future.” Koopman serves as the Chief Economist and Director of the Economic Research and Statistics Division at the World Trade Organization. In this post Koopman provides the Secretariat and Member Countries with analysis and information that promotes a deeper understanding of trade and trade policy’s role in economic growth and development. He previously has served as the Director of Operations and Chief Operating Officer for the United States International Trade Commission, the Chief Economist and Director of the USITC Office of Economics, as a professor at Georgetown University, and in numerous leadership and research positions at the Economic Research Service of USDA. This event is the second in a series celebrating IIEP’s 10th Anniversary. Louis Fox, Chief Economist at USAID, joined us in November for the series’ inaugural event, and Martin Fleming, Chief Economist at IBM, will be visiting on April 9th for the series’ third installment.